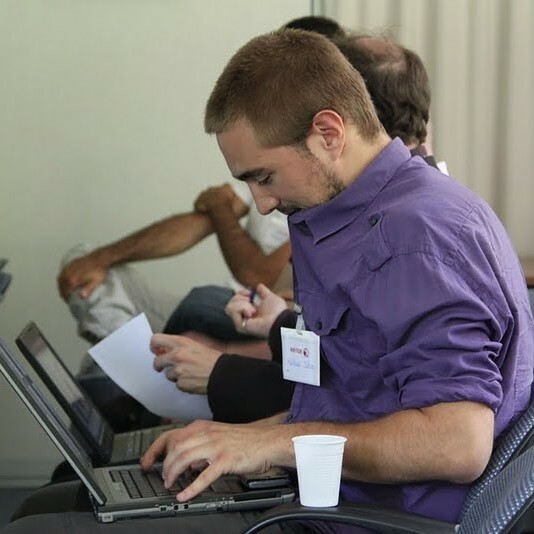 Mickael Istria Software Developer, Red Hat Inc.
► What Is Eclipse IDE? The only prerequisite for installation is to have a Java Virtual Machine installed (such as OpenJDK or Oracle JVM). To make sure you’re ready, just type `java -version` in a terminal, and see that a recent version (>= 1.8.0) is installed and that the target architecture (x86, x86_64…) matches your computer and OS. You can download Eclipse from http://eclipse.org/downloads. There is a generic installer, which is recommended. The installer will guide you through installation. Alternatively, you can download one package dedicated to your use case directly. In this case, installation only requires extracting the archive and running the executable. When starting the IDE, you’re prompted to select a workspace. The state of your IDE (directories visible as projects, preferences, workbench arrangement, etc.) is stored in the workspace location. Your projects and code can either be stored in the workspace location or in another directory. The workspace location is often the default directory when creating new projects, but this can always be changed. In Eclipse, you can simultaneously work on multiple Projects. The term Project in Eclipse can refer to a standalone project, or to a project “module” that has dependency or parency with some other projects in the IDE. You can simultaneously work on totally independent projects, using different technologies inside the same IDE and workspace. A project stores its own configuration in various metadata files, such as .project, .classpath or .settings files. Those project configuration files can usually be shared on an SCM together with the project. Since the projects in a workspace are often linked one another, sometimes it’s best to make sure to clear the Project → Build Automatically option to stop the project from automatically cascading builds to dependent projects. The main user interface of Eclipse is called the Workbench. It is highly customizable. The Workbench can contain several Perspectives. A perspective is an arrangement of the various available panels of the workbench dedicated to specific activities (debugging, coding, memory analysis, etc.). The panels in the Perspectives are called Views. You can switch between perspectives on the right part of the toolbar or via the Window→Perspective menu. You can also open new preset perspectives that are meant to be optimized for certain use-cases. The perspectives can be customized through the Window → Customize Perspective... menu, which allows you to show or hide content from toolbars, the menu, and the (right-click) context menu. As you get familiar with Eclipse, you should spend some time filtering the actions you’re interested in. There are views for many things; each view shows an interesting functionality of the IDE. You can browse and open the available view with Window → Show View (Alt+Shift+Q Q on Windows; Cmd+Alt+Q Q on Mac). Each view has its own configuration and settings that you can manage. If you’re about to work with modular projects, we recommend to browse them using the Project Explorer view (Alt+Shift+Q Q or Cmd+Alt+Q Q, then select Project Explorer), and then to get to the View Menu on the top-right of the view and select Project Layout → Hierarchical. Other options such as Link With Editor are available. The Central part of the workbench is the placeholder for file Editors. When you open a file from the Project Explorer, the IDE will show an editor for that file in this Editor section. Eclipse has a very powerful Quick Access tool towards the top-right part of the workbench (click the text box or use Ctrl+3 or Cmd+3 to activate). You can type in a keyword and see all possible related actions. So whenever there’s something you want to do, use Quick Access and type a keyword. Most of the time, you’ll find what you need! The Eclipse IDE is relying on the Eclipse RCP platform for Rich Applications. This platform is extremely extensible. So the Eclipse IDE is only the beginning of what you can do—many extensions for it are available from multiple sources. The “official” Eclipse Community delivers regularly what’s called the Simultaneous Release. A number of Eclipse projects conforming to some quality commitment are aggregated in a single extension repository that you can access directly from your IDE. Go to Help → and look at the available sources. You should get a source called Neon (2016-2016) or Oxygen (2016-2017). Select this source, and you’ll be able to browse all the extensions offered as part of this simultaneous release. Eclipse Marketplace (http://marketplace.eclipse.org) and the Marketplace Client in the Eclipse IDE (Help →Eclipse Marketplace…) are the most user-friendly ways to browse and install Eclipse extensions from Eclipse.org or a 3rd party. Some extensions are not in the Marketplace. Those extensions usually provide a URL that references an update-site, or p2 repository (p2 is the package manager for Eclipse plugins). You can browse and install their content via the Help → menu, using the Add Location button to add the provided URL as a Source for finding new extensions. You can also write your own Eclipse extensions, or build your own Eclipse RCP-based applications. 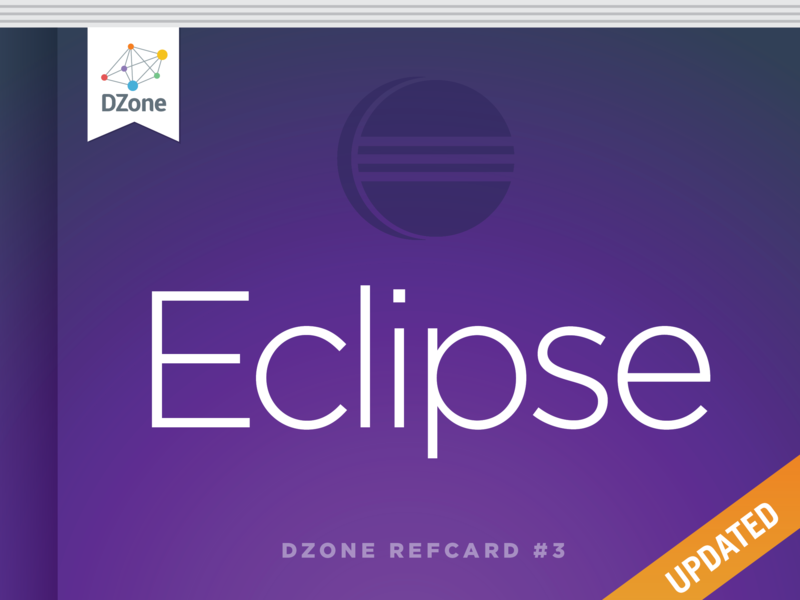 Although this Refcard doesn’t cover the development of Eclipse plugins, the starting point is to install Plugin Development Environment (PDE) from the simultaneous release repo and create a new plugin project. See https://www.eclipse.org/pde/ for more details. As you’re probably going to spend plenty of time using the Eclipse IDE, it’s worth spending some time looking at the customization possibilities. Open the Window → Preferences menu, or type Preferences in Quick-Access/Ctrl+3. Then you can browse available preferences. Changing preferences there apply to the whole workspace. We’ll discuss a few of them here. The General → Keys preference page shows all available commands and the shortcuts assigned to each of them. You can edit the shortcuts or switch between different schemes. For example, an Emacs keybinding is available out-of-the-box, and some extensions provide other bindings, such as a Vim-based binding. The default Eclipse IDE theme is a light one, but a dark one is provided if you prefer. From this General →Appearance preference page, just select the Dark theme in the combo, apply and restart the IDE. Something that can also be convenient to configure, mainly for accessibility purposes, are the fonts and colors used by the IDE. The settings from the Theme can be overridden from the General →Appearance → Colors and Fonts preference page. If you feel creative, a Marketplace extension called Jeeeyul's Eclipse Themes adds some more colorful themes for the Eclipse IDE and allows you to customize themes in more detail. Projects have specific preferences. You can access them via the Properties context-menu on a project or by using the Alt+Enter shortcut. There’s usually a Save Actions page in the project and workspace preferences. This allows to configure things such as Code-Style, some automatic refactorings, or other useful operations to trigger when saving a file. Project Properties also allow you to configure validation, compilation, and everything else for controlling your project behavior in Eclipse . Have a look at the content of Help → Tips & Tricks when landing in the Eclipse IDE for the first time, or after an upgrade of the IDE. Learn some good shortcuts. As explained above, you can see and change these via the Preferences. Here are a few good ones, in additional to the usual system shortcuts such as copy/paste. Ctrl+1 ⌘+1 Quick-fix and Refactoring. When in an editor, this shortcut on a piece of code should provide you with the interesting operations to apply at this location. Eclipse lets you create a large variety of projects and files. The actual list depends on which extensions are installed. So if you want to create a project for some technology, make sure the necessary extensions are installed in order to have the best New Wizard possible. Then it becomes only a matter of picking the best wizard in the list you see when doing File → New → Project… or using the Ctrl+N shortcut (or typing New Project in Quick Assist/Ctrl+3). Many of those wizards offer an optional “template” page that can generate a sample project to start more efficiently in your development. It’s recommended that you always have a look at those, and prefer hitting Next > rather than Finish on wizards to take advantage of the examples and templates. Source Control Managers are usually accessible via the File → wizard, and once you have a project in a workspace, by the Team context-menu on the project. Those 2 entry-points should lead you to every SCM option possible. To clone a Git repository, show the view (Windows→Show View/Alt+Shift+Q Q → Git Repositories), or use Quick-Access/Ctrl+3 and type Clone. Files from a Git repository get decorated with a in your Project Explorer to show whether they’re staged for commit or not (prefixed with >). The Team context menu offers all useful operation such as (git add), (git reset --), (git blame), and more. There are 3 very useful views to manage everything in Git. the view (see above) to view and manage Git repositories in Eclipse. The view allows you to always see and manage the content of your commit. It shows data similar to Git status, and you can drag and drop files between Staged/Unstaged to include them or not in your commit; you can prepare a commit message, amend a previous commit, then Commit and Push in the same view. The view (open when selecting the Team → Show In History context menu) allows to view history of the project or file (scope can be configured on the top-right buttons of the view), and to easily reset, revert, checkout, compare with… a previous revision. You can push a commit by selecting the Team → context-menu on a Project, or via the context-menu in the Git Repository view, the Commit and Push… button of the Git Staging view, or Quick Access/Ctrl+3. In case you don’t know a better way to import your project, you can give a try to the File → wizard. This wizard will take the location you want to work with and will run some analysis to find a good configuration for the project to take advantage of the relevant IDE features. Eclipse also provides some wizards dedicated to specific project types. If you already know some things about the project, and if you’re not satisfied with the generic Open projects… wizard, then you can go to File → and find whether there is a dedicated wizard that matches your project. From the New Wizard (accessible via File → New → Projects… or Ctrl+N or Quick Access), you can reach multiple wizards to create projects. The 3 main ones for Java development are. Maven project: Generates a Maven project, creating the pom.xml, the project structure. A page of the wizard allows you to select archetype (project templates/examples). It’s often useful to spend time considering the best archetype to use. Dynamic Web projects: This is actually the entry point for a Servlet-based project, usually packaged as a .war and deployed to an application server. Plain Java Project: A simple Java project, suitable for standalone Java libraries or applications. The generated project won’t include support for a build system or frameworks. Once your Java Project is created, you can right-click on it to perform many operations, such as creating a new class, a new interface, a new JUnit test, or some specific classes (Beans, Jax-RS) for certain projects. On a project, try the Properties context menu (Alt+Enter). From there you can tweak many things, such as error reporting, classpath, Java compliance, and more. Here are the main shortcuts for Java navigation. As always, many more shortcuts are available in the General → Keys page of the Preferences. By default, Eclipse is configured to Build Automatically (in the Project menu, Build Automatically is ticked). This enables various analyzers on the project and reports errors and problems directly in the code. You can at any time force a full build by going to Project → menu (Ctrl+B), or typing “Build All” in Quick-Assist/Ctrl+3. It may be useful to sometimes run Project → Clean… to clean the various caches and work folders if you suspect those are causing some trouble. Eclipse usually provides resolutions for the errors it reports. Those are named Quick-Fix and you can view them by hitting Ctrl+1 when selection is on a problem. The severity of most problems can be configured in the Project Properties. Some Eclipse extensions such as the FindBugs plugin can provide additional error reporting to improve the quality of your code. At any time, the view (Window→ Show View/Alt+Shift+Q Q or “Problems” in Quick-Access/Ctrl+3) lists all detected problems in all your projects. Try to fix all issues reported in that view for good productivity and good code quality. The Run As context-menu on a Java element is populated by what seems to be the best Run Configurations for your current selection. Just select one and it will run it. It’s often useful to customize the pre-existing Run Configurations or even create your own. Customizing a Run Configuration allows to more easily set additional System Properties, Environment Variables, Java settings, etc, that will be used at runtime. Once you have a Run Configuration ready, it is stored and can be run as many times as you want. The entry points to tweak Run Configurations are. Run Configurations… in Quick Access/Ctrl+3. Eclipse also has Run Configurations for specific kinds of project, such as Maven, Applet, OSGi, and Gradle. Extensions for frameworks often provide some specific Run Configurations, so if you work on some framework that’s not supported out-of-the-box, make sure you spend some time trying to find an extension for it on Marketplace or on the web. Debugging in Eclipse is just another flavor of running the application as documented above. The difference is that we now talk about Debug Configurations which are just like Run Configurations, but with debug enabled. or using some more specific flags in some context, then get to the Debug Configurationsmenu (click on toolbar button menu, or with Quick Access/Ctrl+3), and create a new Remote Java Application debug configuration. Set the debug port and the related workspace project, then you’ll be able to fully debug your external application. Add breakpoints in your Java code by double-clicking on the column to the left of line numbers or using the right-click → context-menu. Manage breakpoints (enablement, grouping...) from the view. A powerful feature is Conditional Breakpoints. On a breakpoint, do right-click →Properties to specify a condition to stop on a breakpoint. The view allows you to write some “scratch” pieces of code to run, evaluate, inspect your custom code in the context of the currently selected stack frame. The context-menu on a variable, field or expressions adds it to the Expressions view for constant re-evaluation. As usual, views can be opened via Window → Show View menu, Alt+Shift+Q Q shortcut, or using Quick-Access/Ctrl+3 and typing the view name. The context-menu operations are also available with Quick-Access/Ctrl+3. Most of those views are visible by default in the Debug perspective, that will be recommended when Eclipse the debugger notices the target application is suspended by a breakpoint or an error. Double-click on left column Double-click on left column Add/remove breakpoint on selected line. Eclipse comes with an integration with JUnit. You can create unit tests from the New Wizard under Java→JUnit category, or on the context-menu on a Java element or from Quick Access/Ctrl+3. Run those tests with right-click →Run As → on a JUnit test class. The test report will be shown in a dedicated view that shows a clear status of your tests, and allowing to do advanced filtering, to navigate inside your production code and to compare expected and actual results. Running a JUnit test is a regular Run/Debug Configuration, so the steps mentioned above can be used to control execution and debugging of Unit Tests. On Marketplace and other places on the web, you can find nice additions for Eclipse regarding testing. For example, support for TestNG, test coverage with EclEmma, automatic generation of tests and easier navigation between unit test and class under test with MoreUnit, or continuous test execution in background with Infinitest can be very useful. When you’re done with your code and want to turn your project into a delivery, you can usually open the Export Wizard via the context-menu on a project. You can select multiple strategies for export. It’s up to you to decide which one is the best according to your project. The most common ones, depending on your project, are and WAR file. Maven integration for Eclipse is provided out-of-the-box, it doesn’t require any addition. To import Maven projects, use the wizard from the File → menu or from Quick-Access/Ctrl+3. Maven support in Eclipse will run various analysis, and may recommend you to install some extensions to better support your project. Do NOT use the deprecated mvn eclipse:eclipse command. Once your Maven project is imported, you can write code taking advantage of all Eclipse features, including incremental build and error reporting. If you do need to specifically run the Maven build, right-click on the Run As… → context-menu. A Maven build in Eclipse is a Run Configuration, so it can be tweaked or even debugged as mentioned earlier. Eclipse has an extension for Gradle projects, which is called BuildShip. If your IDE doesn’t include Gradle support, you can install it from Marketplace. Eclipse Bower / npm tools use the system installation, hence the following software must be pre-installed. After pressing the Finish button bower.json will be created under specified directory. Use this file to add dependencies. To install specified dependencies just right-click on the bower.json → Run As… →Bower Install. The execution output will be available in the View. Then dependencies are now available for development. npm support can be used the same way: wizard in File → New… → Other… → will create the package.json file and npm Update are available under Run As for this file. Eclipse Grunt / Gulp tools use the system installation, hence the following software must be pre-installed. NOTE. 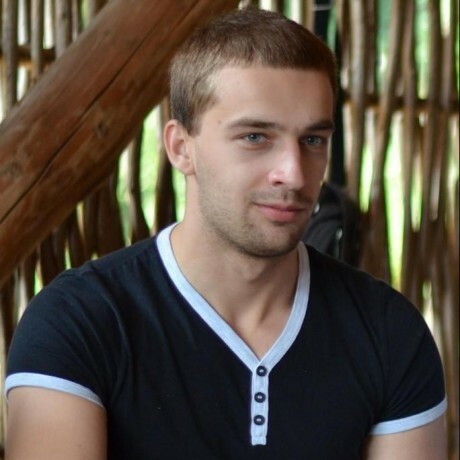 gulp-cli/grunt-cli do not install Grunt/Gulp on the system, but rather act as a proxy in charge of running the specific version of Gulp/Grunt requested by the project in package.json. This allows using multiple versions of Gulp/Grunt on the same machine. First thing one should do after creating a project is to define all required dependencies in package.json. Both Gulp and Grunt have massive plugin library that can satisfy most, of developer needs. After that should be executed (Run As > on package.json). This command will install all the dependencies to the node_modules folder. Now is a high time to start working with Gruntfile.js / gulpfile.js and define tasks. All tasks will be available in the Project Explorer view under Gruntfile.js / gulpfile.js. Eclipse Node.js tools use the system installation, hence the following software must be pre-installed. NOTE: This change will affect all Node.js launch configurations since this is a workbench-wide setting. Running and debugging Node.js applications is pretty straightforward. You just need to select Run → Run Debug Configurations… or Debug -> Debug Configurations… and double click Node.js Application. This will create a new Node.js Application Run/Debug Configuration where you need to specify a project and a main file to be run / debugged. Optionally in the Arguments tab you can specify Node arguments and working directory. After pressing Run or Debug you can monitor application's output in the view and, if debugging, use the various features of the perspective. Node.js Application run/debug actions will be available in context-menu for projects containing a package.json file or a .js file that is not inside bower_component nor node_modules folder. To use the shortcut just right click on the project or a .js file → Run As / Debug As → Node.js Application. Hovering over variables in the editor also shows their value directly. In order to change the code during debug session just save the file with new changes, and “redeploy” it with right click→ V8 Debugging → Push Source Changes to VM. Then new changes will be applied and available in the debug session. Basically, in other aspects the process of debugging Node.js is the same as for Java. For more details, like debug shortcuts refer to the Debug section of the Java Development 101. The Eclipse Community is an open group of people and involves several hundreds of committers, several thousands of contributors and several millions of users, who contribute to Eclipse and use it either as individuals or on behalf of some organizations. This community aims to deliver good tools and platforms for many things, the Eclipse IDE is only a part of what the whole community produces. The Eclipse Foundation is a non-profit organization aimed at providing to the community some good infrastructure, community management, communication media, event organization, legal assistance… in order to keep the community innovative and productive. More info can be found from the http://eclipse.org site. There a lot of Eclipse-specific events yearly: the community organizes Eclipse Hackathons or DemoCamps or Eclipse Days with the support of the Foundation, and the Foundation organizes 3 major events yearly called EclipseCons. Stay in the loop with Eclipse, and send feedback thanks to the following links. Each Eclipse component can be seen as a sub-community, which may use different tools and process. Get in touch with the specific component via its forum or mailing-list to learn more about how to get help and contribute.